Edit: This post was recently included in the March edition of the Festival of Trees, a blog carnival focusing on, you guessed it, trees. You can check out the full edition at Orchards Forever. There is a bush in the backyard, behind the house, growing beside a large stump. The stump is what remains of a mature pine that came down before I was around, struck by lightning. The shrub and stump were a play-spot for my sisters and I when we were young, and I remember picking blackcaps from the canes that grew under its branches. 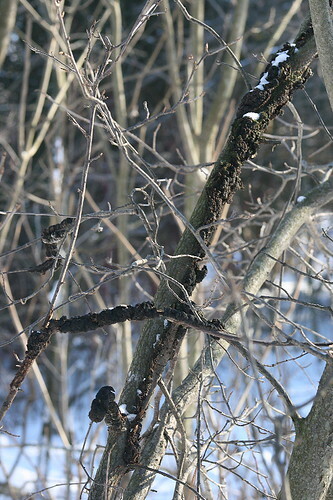 In recent winters I’ve noticed a few black, crusty growths forming on some of the small branches. It’s a familiar phenomenon, but one I hadn’t investigated before. When I was much younger we had a plum and a cherry tree on the property, and I recall plucking ripe plums from the branches of the one, and my parents complaining (good-naturedly) about the birds eating the fruit from the other. Both gradually succumbed to a crusty black fungus, and while the cherry struggles on, the plum long ago died and came down (although I did notice a hopeful new sapling right beside where it used to be). So to see these growths forming on another tree I knew as a kid, I thought I’d investigate. Turns out, it’s fairly common. 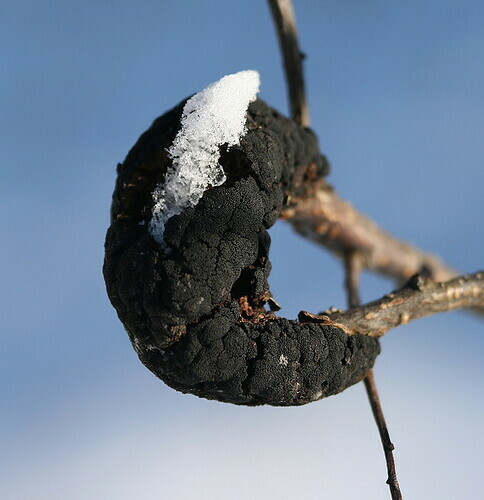 It’s a fungus, Apiosporina morbosum, known by the common name “the Black Knot” (which sounds rather dramatic). It almost exclusively infects trees of the genus Prunus, which includes cultivated species such as plum or cherry, or wild native species such as chokecherry or black cherry. The little shrub in the backyard is a chokecherry. This little tree, although I didn’t try to identify it, is probably a black cherry, the most common Prunus species in these woods. It has a substantially more progressed infection. The fungal spores infect the young buds of the tree when it’s just leafing out in the spring, and it takes a few months for the infection to appear. Initially just look like thick brown galls. Eventually, the following spring or summer, the bark splits and the gall turns into these charcoal-black, crusty growths. The fungal growths are most often seen on smaller branches, but like in the above photo, can sometimes spread to the trunk of the tree. Although an infection on a branch can compromise the branch’s growth and create disfiguring contortions (such as the first photo), it only kills the branch if the growth completely encircles it (called “girdling”). Any portion of the branch above the fungus will die. If the fungus girdles the trunk of the tree, the whole tree will die. The fungus will continue to spread over many years, and eventually will either compromise the tree so severely it will die, or girdles the trunk causing death. The fungal spores are released by splashing rain and carried by the wind, and mild spells during the spring rains trigger their production and release. Once a tree’s infected, an individual growth will only live a couple years (after which it dies and turns whiteish-pink, colonized by another species of fungus), but during that time it has the ability to spread to other areas of the tree. The good news is, you can do something about it if one of the trees in your yard becomes infected. It’s simply a matter of removing the infected bit, cutting back to 10 or 20 cm below the infected bit (since the fungus travels under the bark and may be present outside of the growth). This is best done in the winter while the tree and fungus are both dormant, and the fungus should be burned or otherwise disposed of so it doesn’t infect other trees.